Imagine you have a nearly perfect dark chocolate brownie recipe. After tinkering with it a little (original recipe here), you’ve got the flavor and the texture just right, but you need to make one more batch to ensure the correct pan size. Your last batch in a 13×9″ pan made brownies wasn’t quite right so you want to try an 11×7″ pan instead. You’re convinced this is going to be perfect and everyone who tries one of these dark chocolate brownies is going to be blown away. It’s going to be amazing! Then imagine as you get down to the business of baking these life changing brownies you are able to coax exactly the right amount of Hershey’s Special Dark cocoa powder out of the container, and not a teaspoon more. A good start. After doing a happy dance you set your last four eggs out on the counter to warm up, two for the brownies and two for a batch of cookies to come afterwards. It’s all working out just right! You melt some butter, and then mix it with the right amount of sugar and the carefully harvested dark cocoa powder. Everything is going well. But then you tune out for a few minutes, probably watching something stupid on TV, and accidentally add all four eggs to the mixing bowl. Aargh! You stare at the four eggs sitting there on top of the brownie batter. What now? You can’t very well start all over again without going to the store for more cocoa power and eggs (and it’s too late in the day to consider that). The remaining options are either toss everything out and give up, or make the brownies anyway and see how the turn out with four eggs instead of two. You choose the latter and cross your fingers as you put the pan in the oven to cook. Maybe everything will be fine. Unfortunately that’s not the outcome. The brownies turned out dry and spongy. They seriously had the consistency of a kitchen sponge. Basically inedible. What a waste of good baking ingredients! So the moral of the story is, don’t bake distracted! In case you haven’t noticed, I’ve been pushing myself to write more often now that October is drawing to a close. This means that National Blog Posting Month (NaBloPoMo) is right around the corner. I missed at least one day of posting in November 2012 and 2013, but if at all possible I’d like to complete the full challenge this year. I’m not sure how feasible that’s going to be, or whether I’ll even have enough topics to write about, but I’m going to try. Most of the time I find writing therapeutic. When I have something to say and I don’t feel like it’s something I’m forcing myself to do, I love writing. I started blogging fifteen years ago as a creative outlet during my days as an engineering student, and a way to share my day-to-day life with anyone who was interested. I think the life of a college student is more conducive to blogging than your average adult’s, though. The whole working, eating, exercising, and sleeping routine doesn’t really lend itself to a lot of sharable yarns. These days I have to dig deep to find something to write about on a daily basis, but I know the NaBloPoMo challenge will be a good mental exercise. But since it’s still October I’m going to take the opportunity to cut this post short while I’ve got a chance. No strenuous exercise for my brain tonight! I missed another race, but this time I don’t have work to blame. 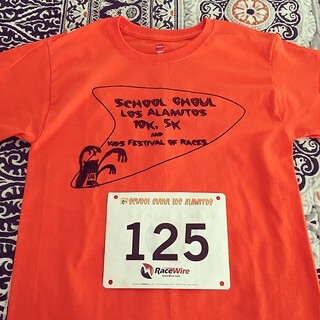 On Saturday night I went to bed with all of my running clothes laid out and other stuff packed and ready to go for the School Ghoul 10K in Los Alamitos the next morning. Unfortunately, I neglected to set an alarm. Funny enough, I woke up several times during the to check the clock, but I still managed to oversleep without an alarm to wake me up at the right time. Awesome. I woke up at the time I wanted to arrive for the race. In a panic I sprang out of bed, threw together my breakfast, and then scrambled to start getting ready. After about ten minutes I realized there was no way I’d be able to finish all of my preparations and get to the race in time. (Usually I want to finish my breakfast an hour beforehand, but that was going to be impossible.) This really annoyed me, but I decided it wasn’t worth it to rush through all of my preparations and still be late. So instead I just went back to bed to finish my banana berry smoothie and relax for a few extra hours. 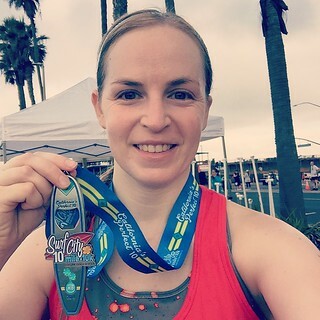 It was a shame that I missed out on a second medal opportunity just one week after skipping the Long Beach 5K, but I think it was the right decision. It really wasn’t worth stressing over. I ended up running 6 miles that evening instead so I made up almost all of the missed mileage by the end of the day. That’s all that really matters as far as my half marathon training is concerned. There’s no way I’m going to miss my next race, though – the Surf City 10 Mile this Sunday. I’ve been looking forward to it for months! I’ll just make sure to set two alarms this time. One day last week after a deliriously long day at work, I ordered some battery-operated candles for my beloved jack-o-lanterns from both Pottery Barn and Grandin Road. You gotta have options, right? And it wasn’t like I had time to go to any brick and mortar stores while I was working such crazy hours. For the last couple of weeks I’ve been using some cheap LED lights from Ikea in my ceramic pumpkins and they look really weird. They’re too bright and the light’s not “warm” enough, or something. The candles I ordered are supposed to flicker realistically, so we’ll see how they look when they finally arrive. It’s going to make my little Halloween display look so much better. I can’t wait! Also, this afternoon I pulled all of my Halloween t-shirts out of storage and put them into my workout clothes rotation. I wore a Hello Kitty Halloween shirt running tonight. She has a bat on her head instead of a bow. I love Old Navy graphic t-shirts. Besides these small actions, I’ve got a lot of holiday preparations to work on this week. I’m going to a Halloween party on Saturday night so cooking is on my “to do” list before then. 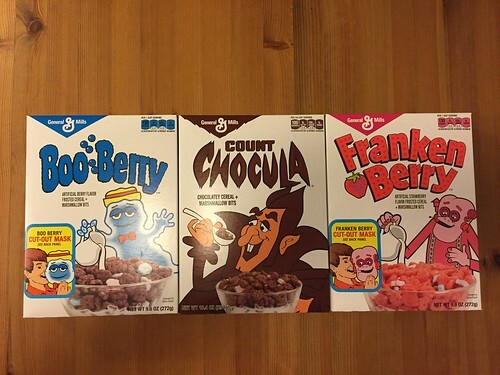 I’m definitely going to make some Rice Krispie type treats out of the Boo Berry, Count Chocula, and Franken Berry cereals I picked up at Target recently. I’ve been wanting to make them for years and now I have a great excuse! I’ll let you know how they turn out. The bigger question is, will I be able to make anything for the party that’s not going to wreck my new eating plan, but still tasty enough to share with others? My favorite pumpkin dip is indeed grain free and tastes great with diet-friendly apple and pear slices, but it does include cream cheese and powdered sugar – two things the Paleo diet frowns upon. But it’s so delicious (and easy to make) that it might just be perfect for the party. I’ve definitely got some work to do! Wow, how is it already October 20th? The last three months of the year are always my favorite, and two-thirds of October is already behind me! I’m pretty annoyed that I haven’t been able to enjoy the first twenty days of this month as much as I wanted to, but it really couldn’t be helped. On Friday I finished an extremely intense ten-day activity at work that occupied almost all of my waking hours during that time, as well as more than a month beforehand. Not only was I tethered to the office during those ten days (I got called in late at night twice), but I was exhausted when I got home each day so my extracurricular activities were limited. I only ran a couple of times which set me back in my half marathon training, and the only other place I visited besides work and home was the grocery store. Thanks to all of my cooking efforts I was able to maintain my grain-free meals during this trying time, but the time in between is where it all went wrong. I ate quite a few Oreos (new and different flavors like limeaid, caramel apple, and pumpkin spice), sampled more fancy chocolates (Bissinger’s) than I’d like to admit, and drank Coca-Cola like it was going out of style. I am paying for all of these things this week. The scale says I’ve gained a little weight, I’m going through caffeine and sugar withdrawals after cutting myself off from soda again, and my running has definitely suffered. Time to start making up for lost time! After cooking all weekend I’m back on the wagon with my diet, and I have quite a few lunches and dinners in the fridge and freezer ready to keep me from cheating when I’m hungry. Also, I ran 4 miles on Saturday and 6 miles on Sunday so I’m getting back in the groove with my half marathon training. (I have a funny story about my 6-mile run yesterday, but I’ll share that another time.) Now I just need to get down to the business of enjoying the rest of October! I’ve already watched “It’s the Great Pumpkin, Charlie Brown” once, and I’m trying to figure out when I can go back to Disneyland to enjoy the Halloween festivities before the end of the month. Plus, I’m going to a Halloween party on Saturday night. There are so many wonderful things about this time of the year. It’s time for me to get out and enjoy them! I’ve had a lot of people ask me what I like about my new iPhone 6. That’s not a question I have an easy answer to. In general, I’ve found that the iPhone 6 is pretty much exactly the same as the iPhone 5, at least as far as actual operation goes. The fingerprint recognition is pretty cool, but I don’t use it. My phone is mostly for simple stuff like Facebook, Twitter, and email, as well as using Map My Run to keep track of my half marathon training. So when people ask what I like about my iPhone 6, I usually try to come up with something other than the fact that the glass isn’t shattered and falling off, like on my old iPhone 5. Even though it works great, I guess I’m not exactly in love with the iPhone 6. In fact, there are a few minor things I’m not a fan of. Like the size. Granted, the iPhone 6 isn’t all that much bigger than it’s predecessor, but I’ve added a case (to avoid the spiderweb effect if I drop it) which exacerbates the issue. I’ve become accustomed to carrying my phone around in the back pocket of my jeans (I don’t have a purse I like anymore), but that’s not nearly as easy as it used to be with the size of the iPhone 6 plus the case. Also, it’s much more difficult to go running with a larger phone. Some of my shorts and capris have back pockets which are perfect for stashing my phone while running. No extra belt needed. But now with the iPhone 6 I can barely squeeze it into those pockets or into the storage pouch on my hydration belt (for longer runs), and that’s with the case removed! And taking the case off every other day or so is no picnic. As much as I like the case I bought (it has little rubber grips to make it easier to hold and less likely to slide off of other surfaces), I might need to invest in one that’s a little less difficult to remove for running. Don’t get me wrong, I’m not sorry I got an iPhone 6, but it’s going to take a little getting used to. The good news is that I’ve discovered the beauty of running pants with side pockets. The two pairs that I’ve gotten recently have pockets on the outside of the thighs that are the perfect size for my iPhone. Also, it makes the phone much more accessible for changing the music or checking my run progress. I love those pants so much that I’ve ordered another couple of pairs so that I’ll have plenty of options for running this fall and winter. So despite my complaints, I still take my phone with me everywhere I go and use it all the time. I wouldn’t have it any other way! 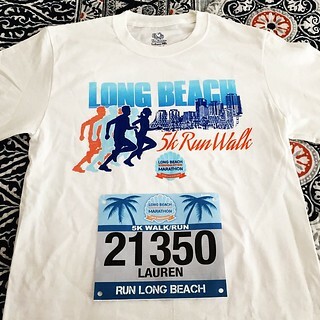 Last Sunday was the Long Beach marathon, half marathon, and 5K. Originally I was hoping to run the half marathon, but it didn’t fit into my training plan for the Avengers Half Marathon next month, so I signed up for the 5K instead. A nice, easy 3.1 mile run at 8:30 AM on an October morning was going to be lovely. As the race approached, fall was finally starting to arrive in Los Angeles and I was really excited about that. We’d had a lot of things going on at work since the beginning of October and I was scheduled to work last Saturday, but fortunately I was supposed to have a day off on Sunday. Perfect, right? Unfortunately things started to unravel on Friday night when I got called in to work at 8 PM for a couple of hours (even though it was supposed to be my day off). However, I still managed to get to the expo on Saturday before work to pick up my race bib and t-shirt, and I even laid out all of my clothes for the 5K so I’d be ready to go quickly the next morning. Then my Saturday shift at work turned out to be much more difficult than I expected, and I didn’t get home until after 10 PM. That might have been reason enough to skip the 5K the next morning, but more compelling was the fact that I had to be at work at 8 AM (despite originally having Sunday off) when the race didn’t start until 8:30 AM. Had it been earlier in the morning I might have been able to go, but I wasn’t that lucky. So I missed out on getting a Long Beach race medal this year, but I’m not really all that upset about it. 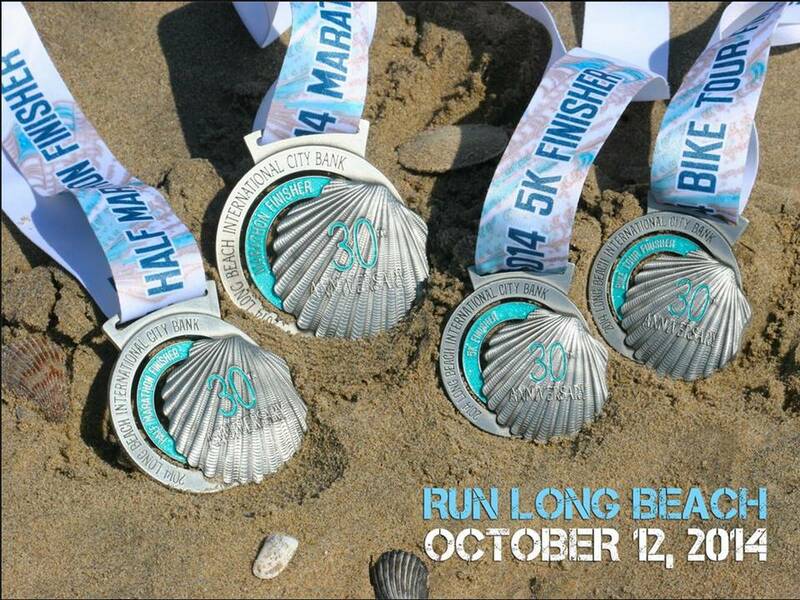 I’m already planning to do the Beach Cities Challenge next year, which means three half marathons in 2015 – Huntington Beach in February, Orange County in May, and Long Beach in October. It might take a bit longer, but I’ll get that medal eventually!